In California, where one million more middle skill workers are going to be needed in the next decade, this is especially true. The California Community Colleges are being counted on to be a source of those middle skills workers. 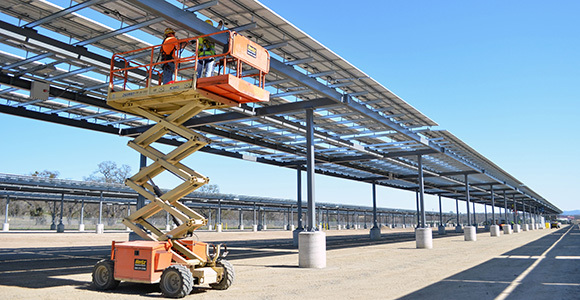 One area of need in California (and there are many) is preparing what is being called the “net-zero workforce," to work with technologies that are designed to reduce energy and resource use. California’s advanced energy industry needs highly skilled workers – 15,000 more of them every year. Community colleges are uniquely positioned to meet this need. The Energy Construction and Utilities Sector initiative engages education and industry stakeholders to amplify student success in delivering the skills, knowledge, and abilities needed for rapid technological advances. On February 12, Community College career technical education (CTE) faculty deans & chairs from seven community colleges will gather in Irwindale to hear from representatives from contactors, the Energy Trade Association, HVAC equipment and services distributors, utilities, education and content providers, energy sector related apprenticeship training programs, building owners, operators and facilities managers. “This meeting in Irwindale is an example of what is happening around the state in a number of different sectors, said Janeth Manjarrez, director of the CTE Enhancement Fund for the Los Angeles Orange County Regional Collaborative. Cultivating and inspiring regional collaboration to discuss curriculum alignment, policy and legislative issues related to CTE and workforce development can help align our educational efforts with what industry needs. Governor Brown signed the SB 852 Budget Act of 2014 which "provided on a one-time basis to create greater incentive for California Community Colleges to develop, enhance, retool, and expand quality career technical education offerings that build upon existing community college regional capacity to respond to regional labor market needs." Funds may be used for equipment, curriculum development, professional development, and other related costs necessary to develop, enhance, retool, and expand quality CTE offerings. California is driven by regional economies -- each with workforce needs that require a regional response from community colleges. With the vast majority of community college students staying in California to work and attending more than one community college, students are better served when more CTE programs are aligned with the economy and coordinated regionally. The California Economic Summit, a year-long process organized by California Forward and the California Stewardship Network, has been focused on workforce and California’s major need for training our workforce. "Employers in California’s dynamic economy need workers who are trained on the latest technologies," said Jim Mayer, president and CEO of CA Fwd, who served on the Community College Workforce, Job Creation and a Strong Economy. "This event shows how colleges can directly engage employers to make sure curricula provides the skills that enable both the workers and businesses to succeed." Better alignment and more streamlined adoption of curriculum was one of the two-dozen recommendations that the Board of Governors adopted late last year.